This is my second year to join this blogfest which Christine Whittemore, Simple Marketing Now LLC, directs. I list Christine’s blogs and those of all the other bloggers below, should you want to see a smattering of takes on the topic and to meet some super bloggers. The theme for this year’s participants in the Bathroom Blogfest “Still Stuck in the 60s?” is inspired by Mad Men. So the second thing I did after determining my approach was to Google “1960s bathrooms” figuring I’d not find much given that some 50 years have passed. 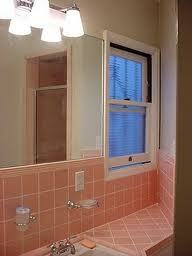 I was surprised to see so many entries about remodeling ideas for 1960s bathrooms. Either buyers through the years have loved pink ceramic tile or they didn’t have the money to remodel or didn’t know how to go about it…….who knows. Something else was clear: I found this information in a snap when goodness knows how long it would have taken anyone in 1960 to learn much about bathroom design in 1910. Chances are Don Draper and Pete Campbell, two of the Mad Men characters, would have lined up in the morning to take a turn in the bathroom as houses and apartments had fewer of them then. The New York Times, October 22, featured a New Jersey modern classic that was listed as one of America’s 10 best in the 1960s and it had four bedrooms and two baths in 1,200 square feet on 10 acres. On to more of my interpretation of the blogfest. Richard & Greg from Hudson Home, www.hudson-home.com, a stunning shop and interior design business in the Columbia County, NY located in midtown Hudson, listed some excellent tips in “Simple Changes for Your Bath,” most of which I agree with. I’ve commented in green where I don’t or when I want to add something and when I can, I give a nod to the 60s in pink. De-clutter – This sounds obvious, but it’s true. If you’re like most people you have a collection of products you no longer use; half empty bottles of shampoo, conditioner and hotel soaps. If you haven’t used it in a month then toss it out. I think a month is hasty. I’d make it a year. Some people like to change shampoos so they might have a few open at once and given the huge sizes available, why waste? Bathrooms in the 1960s were tiny in comparison with the spa-sized spaces in today’s leftover McMansions so being tidy was even more essential 50 years ago. 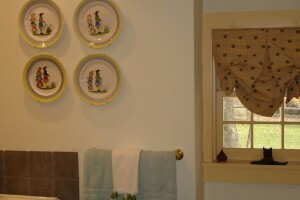 Modest sized bathrooms today often have two sinks and a separate shower and bathtub. Paint – A fresh coat of paint can brighten a tired looking room like nothing else. Since the bath is usually a relatively small space it’s hard to go wrong. If you really hate the color when you’re done just repaint. 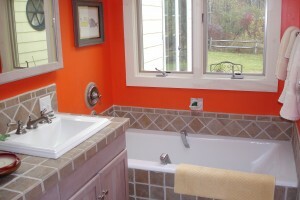 We painted one bathroom a succulent, saturated orange. It cheers on the dreariest, gray day. But what about wallpaper, a product I represented for eons? It’s no longer as popular as it was in the 1960s and could be a lifesaver if you buy a house with horrendous bathroom tile colors and/or fixtures and you don’t want to live through the remodeling mess. To distract from the tile color, pick a busy, multi-colored wallpaper pattern where only the tiniest accent picks up the tile’s hue. Voila! Scent – Scent is powerful and transformative. It can bring back fond memories, help melt away the stresses of the day and transport us to a better place. Stickwith scents that are light and fresh; lemon verbena, lavender and rosemary are all good choices. Buy the best quality scented candles, bath oil, potpourri or air essences you can afford. The better brands use pure essential oils, they cost more but the fragrances are truer and they last longer. Verbena is my favorite, but some people get tremendous headaches from scented candles so take care. A splash of a perfume from a sample [I may not care to wear] shaken into running bath water also works. We’ve gone nuts with scents in my opinion though I bet the Mad Men and their entourage would have adored it especially if they’d thought of it. Towels. In the living room we tell people “invest in good upholstery”. In the bath, “invest in good towels”. If you’ve never had Egyptian cotton towels before you don’t know what you’ve been missing. Good quality towels get softer with each laundering and will last for years. You’ll thank yourself every time you use them. Anything would last longer than the bargain towels I buy. The edges begin to unravel in record time. Bet the Made in America cotton towels of the ’60s at all price points lasted too. Shower curtain. After the walls, the shower curtain is usually the largest block of color in the room. This is a good place to add a splash of color or pattern to the room. Custom shower curtains can be made with just a few yards of fabric. Add a contrast border for added interest. Outdoor fabrics are especially well suited for this purpose. People weren’t so germ-phobic in the 1960s as they are now. Some prefer fixed shower stalls because of the potential of mold in plastic shower curtain linings so best change these frequently. Mirror and sconces. This is a good place to update an otherwise dated looking space. Find a mirror with an interesting frame and add some good lighting. Bad lighting is a sure way to make a bath depressing; good lighting will brighten and open up a space. While you’re at it, put the lights on a dimmer switch so you can adjust the light; bright light for hair and make up; soft light for a relaxing bath. To enhance the walls, along with sconces and a mirror noted in the subheading, I’d add decorative plates and objects that aren’t bothered by humidity. I don’t think much wall decorating went on in most bathrooms in the Mad Men era if only because there wasn’t much empty wall space given the small sized rooms. Further, my bet is that wall tile covered a lot of each wall making it hard to hang things. Today, plasterboard helps keep the price down and achieves a less shiny look. Richard and Greg conclude: So as you can see, there are many simple changes you can make to transform your bath. Look through books and magazines for color and style inspiration and go from there. You’ll be surprised at what big difference small changes can make. What would you add to Richard and Greg’s bathroom sprucing tips? Do you watch Mad Men? What would their ideal bathroom look like? This entry was posted on Monday, October 25th, 2010 at 6:28 pm	and is filed under Blogfests, Fashion, Nostalgia, Old Fashioned Things, Remodeling	. You can follow any responses to this entry through the RSS 2.0 feed. You can leave a response, or trackback from your own site. Jeanne, brilliantly done! What delicious details and great practical advice! I love your references, too. Bravo! Thanks for contributing such style to Bathroom Blogfest 2010! PS: I love Verbena, too. Interesting, about the number of bathrooms in homes. I grew up in a 2-bedroom apartment and one bathroom, shared by four people. I can relate to waiting to get in. My house, built in the 1930s, has four bedrooms and 3 bathrooms. But the one on the first floor was most likely added later. With only two of us now in the house, I never have to wait. Finally! Several years ago I had a bathroom completely disembowled, and then had fun redesigning from scratch. Since taste is a personal matter, and I would not have welcomed anyones interference, my suggestion is to hire a good contractor who has an in with reputable retailers. There is usually an abundance of fine choices, and the shop will undoubtedly give you a break on the cost. How many, many reasonably priced options we have these days! I can remember back when if you wanted to have a decent bath you had to book a room at the Savoy in London, which I did on occasion at somebody else’s expense. Then the first thing I’d do when I got to the hotel is take a bath. However, if you wanted your own big bathtub, you couldn’t afford it unless you were a millionaire! Now everyone can afford a big bathtub, but not somebody to clean it. Well-researched and informative post and so true to the theme. I love the list of tips and your “green” points to provide a balanced perspective. Happy Bathroom Blogfest 2010! Jeanne to all Christine’s friends: Christine likes the scent of Verbena, so remember this for her next birthday! David, I was brought up in an apt. with one bathroom as well. Somehow it worked but having a bunch is better! Lucrezia, I’ve worked with architects and designers on projects and not. I would say that we saved money and had fewer disappointments and mistakes with professional counsel. Using designers and architects doesn’t mean you don’t choose. It means you save time and have a specialist’s valuable perspective, given that they’ve been through the process umpteen times and have already made mistakes which can be costly when selecting expensive fixtures and decorative elements. Crystal, I love deep dish baths as well, but I don’t like them so big that I sink in. I like them short, so I don’t slip down into the deep. Some of the huge ones I see in magazines look outright dangerous unless you have giraffe-long legs. Bill, Happy Bathroom Blogfest to you, as well. I like the tiles on your web site. I love the idea of using wallpaper to distract from ugly tile. Thanks for the tip.